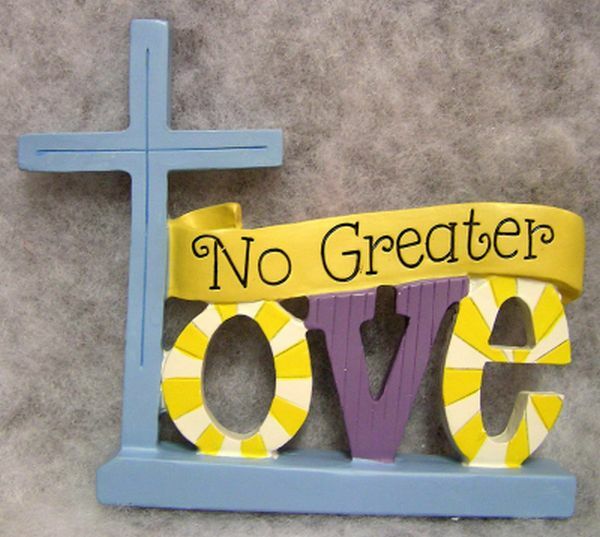 This resin sign says "No Greater LOVE" with a cross forming the "L". It measures 4 1/2 x 5 x 3/4. "LOVE...ties everything together" is the saying on this resin item. It has little buttons along the side. It measures 2 x 4 x 3/4. "FAMILY we always have each other" is the message on this resin sign. It has little buttons along the side. It measures 2 x 5 x 3/4. 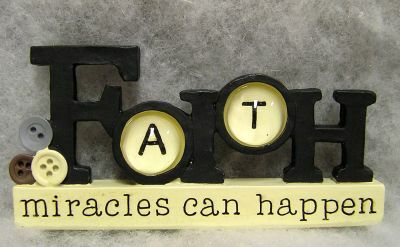 "FAITH miracles can happen" is the message on this resin item. It has little buttons along the side. It measures 2 x 4 1/2 x 3/4. This resin item says "FRIEND you've got a friend in me" It has little buttons along the side. 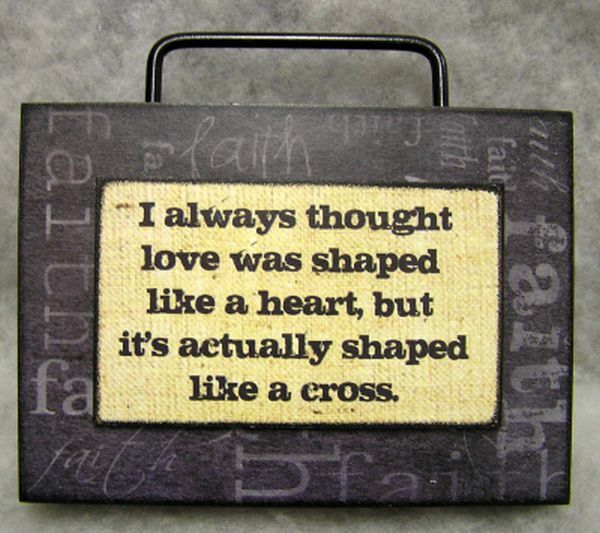 "LOVE Him with all your heart...Mark 12:33" is what it says on this resin sign. 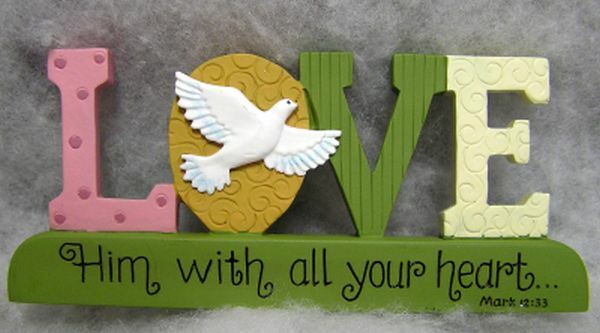 There is a white dove in the center of the "O". It measures 2 1/2 x 6 x 1/2. "I always thought love was shaped like a heart, but it's actually shaped like a cross." is printed on this wooden box sign. It has a black handle on the top. It measures 6 x 7 x 2. This resin house is sitting on a block. 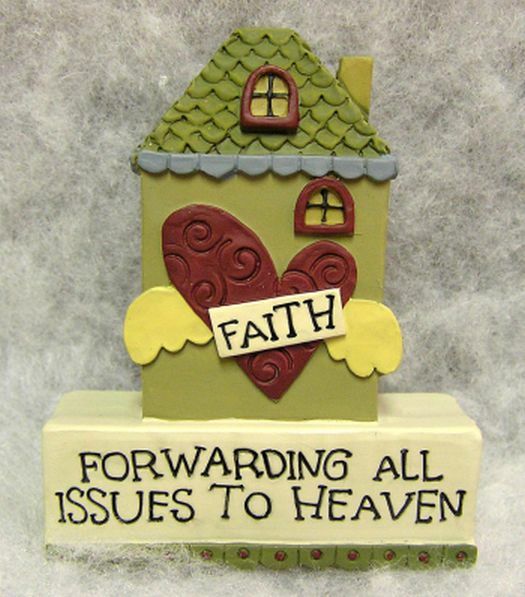 It says "FAITH.... FORWARDING ALL ISSUES TO HEAVEN". It measures 3 1/2 x 2 1/2 x 1. 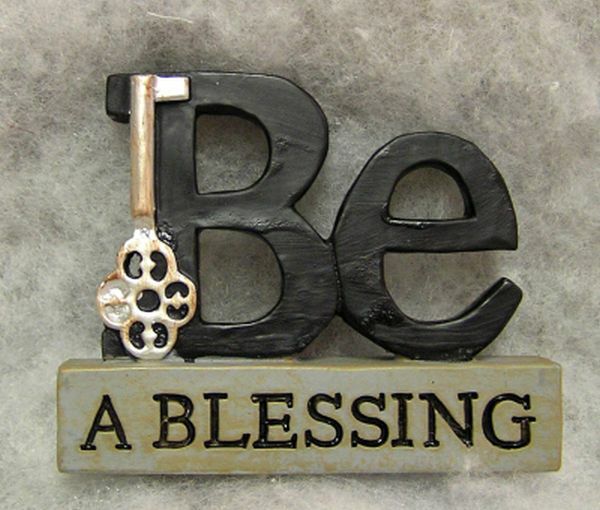 This resin sign says "Be" on the top with a key and "A BLESSING" on the block on the bottom. It measures 2 1/2 x 3 x 1/2. 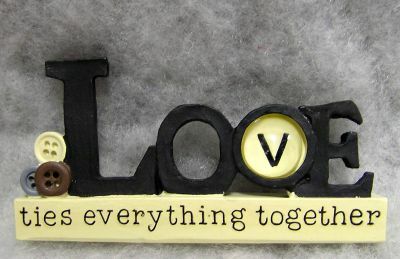 "Love comes from God. I John 1:7" is written on the flower on this resin item. 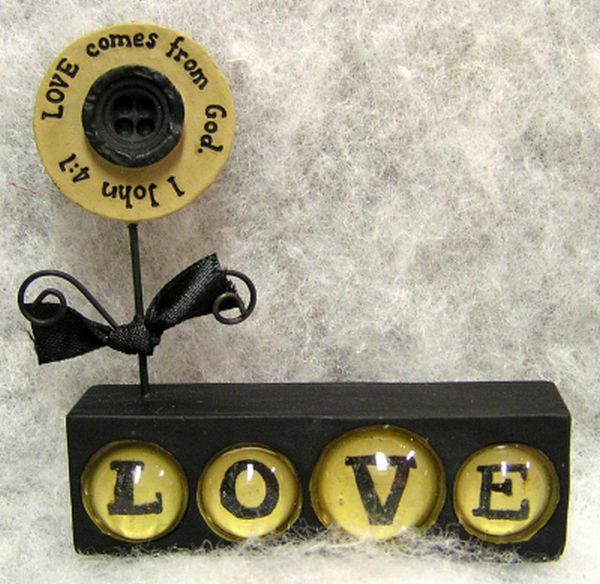 The flower has a button center and it says "LOVE" on the base. It measures 3 x 3 x 1. 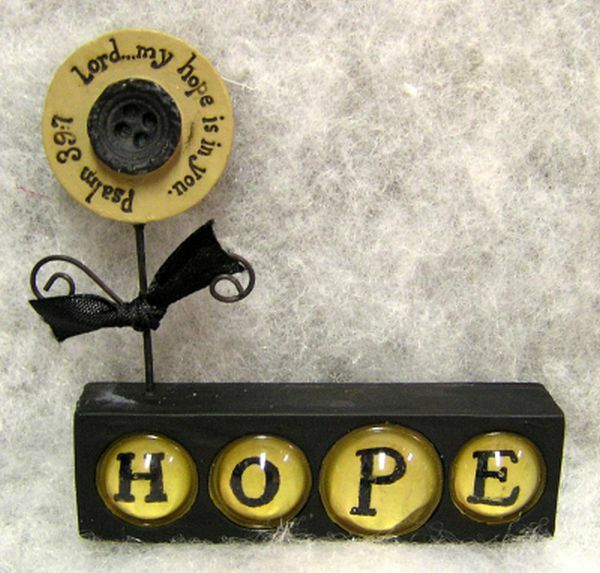 "Lord...my hope is in you. 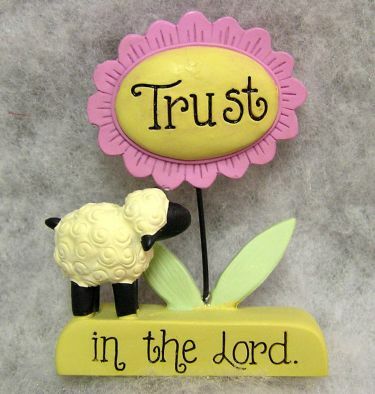 Psalm 39:7" is on the flower of this resin item. It says "HOPE" on the bottom. "Friends love at all times. Proverbs 17:17" is what it says on the flower of this resin item. 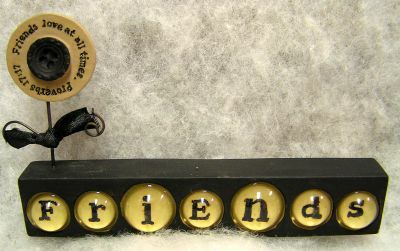 It says "Friends" on the bottom. 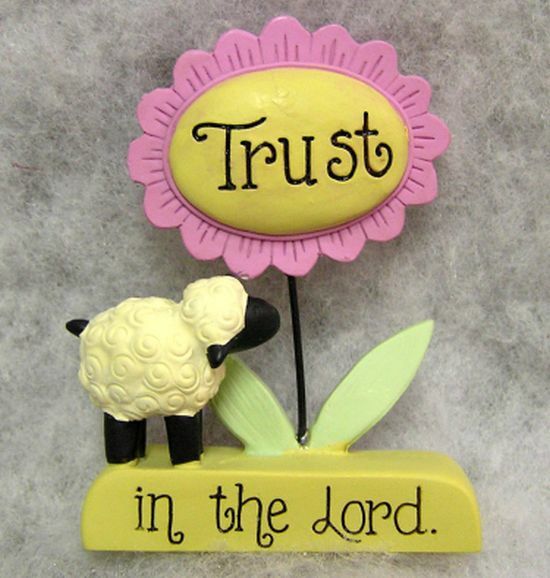 "Trust in the Lord" is the message on this resin sign. It has a flower, base, and little sheep. 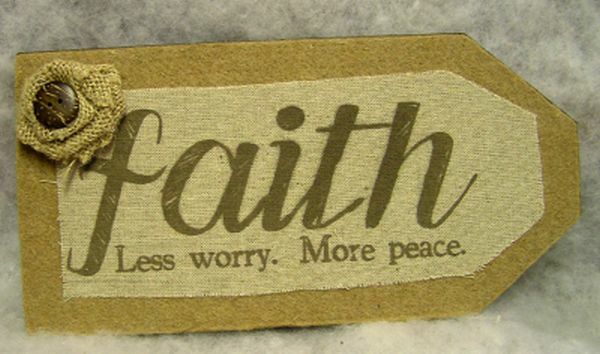 This wooden tag is covered with felt and has a burlap piece that says "faith... Less worry. More peace." It has a burlap flower with a button in the center. It measures 5 x 10 x 1.